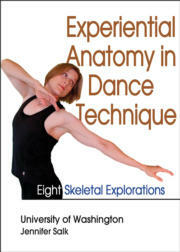 Experiential Anatomy in Dance Technique: Eight Skeletal Explorations is a DVD that helps dancers better understand their bodies—and in doing so, become more dynamic and versatile. The DVD explores eight body areas, identifies skeletal and anatomical features, demonstrates phrases and routines, and contains lesson plans with exercises. The more dancers know their bodies, the more accomplished they can become. Experiential Anatomy in Dance Technique: Eight Skeletal Explorations will help instructors develop class material that allows their students to improve their understanding of their bodies—and their ability to make educated choices about their movements while becoming more dynamic and versatile dancers. This DVD offers a basic understanding of human anatomy for instructors and students who have not had any anatomy or kinesiology courses. At the same time, it offers those who have had or do teach anatomy courses an opportunity for a deeper investigation and review of anatomical structures and how those structures affect movement. choreographs phrases that explore that particular body area. The DVD contains lessons with phrases and exercises for each body area. Instructors can choose any body part and select any part of the lesson plan at any time. The DVD also includes a tutorial on getting the most out of the DVD, alternative camera angles, commentary on how and why the phrases were created to promote greater anatomical understanding, and PDFs with suggested readings to enhance understanding. Experiential Anatomy in Dance Technique is a great tool for instructors, dancers, choreographers, and others interested in dance. Its detailed instruction and exploration of the body will help instructors enliven their classes, resulting in students’ learning to make intelligent decisions about how to train and move. Reference for dance instructors at the college, secondary, studio, and elementary levels; dance students; professional dancers; choreographers; and body-work specialists. Jennifer Salk, MFA, is an associate professor at the University of Washington, where she teaches modern dance technique, composition, improvisation, and other dance courses. She is an accomplished choreographer, creating and reconstructing performances for several companies. She has also served as a guest artist in numerous residences and at workshops. Salk has also authored scholarly works and presented at National Dance Association and other conferences. She has received grants and awards for her excellence in teaching from the University of Washington and from the University of South Florida.